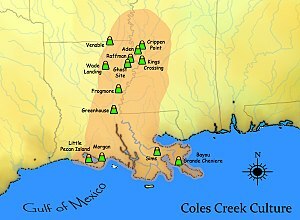 The Coles Creek culture is an indigenous development of the Lower Mississippi Valley that took place between the terminal Woodland period and the later Plaquemine culture period. The period is marked by the increased use of flat-topped platform mounds arranged around central plazas, more complex political institutions, and a subsistence strategy still grounded in the Eastern Agricultural Complex and hunting rather than on the maize plant as would happen in the succeeding Plaquemine Mississippian period. The culture was originally defined by the unique decoration on grog-tempered ceramic ware by James A. Ford after his investigations at the Mazique Archeological Site. He had studied both the Mazique and Coles Creek Sites, and almost went with the Mazique culture, but decided on the less historically involved sites name. The Coles Creak area is further subdivided into Coles Creek proper in the northern part of its range throughout the interior Mississippi Valley, and Coastal Coles Creek, being found along the Gulf coast roughly south of the latitude of modern Baton Rouge, Louisiana. Although earlier cultures built mounds mainly as a part of mortuary customs, by the Coles Creek period these mounds took on a newer shape and function. Instead of being primarily for burial, mounds were constructed to support temples and other civic structures. Pyramidal mounds with flat tops and ramps were constructed, usually over successive years and with many layers. A temple or other structures, usually of wattle and daub construction, would be built on the summit of the mound. A typical Coles Creek site plan consisted of at least two, and more commonly three, mounds around a central plaza. This pattern emerged in roughly 800 CE and continued for several hundred years. By late Coles Creek times, the site plans are often enlarged to include up to three more mounds. Sites typical of this period are Mount Nebo, Holly Bluff, Kings Crossing, and Lake Agnes. Many Coles Creek mounds were erected over earlier mortuary mounds, leading researchers to speculate that emerging elites were symbolically and physically appropriating dead ancestors to emphasize and project their own authority. Long-distance trade seems to have been negligible at this time, as exotic goods and trade items are rare in Coles Creek sites. There is little evidence of domesticated or cultivated plants until the end of the Coles Creek period. Acorns are a dominant food source, supplemented with persimmons, palmetto, and some starchy seeds such as maygrass. Coles Creek populations may have loosely "managed" certain plant resources in order to promote a better or more consistent food supply. Maize is found in very limited quantities, but by 1000-1200 CE had begun to increase, although nowhere near the levels it would reach in later Mississippian culture times. A large group of twelve mounds located in Plaquemines Parish, Louisiana from the Coastal Coles Creek culture. A Late Coles Creek site in Concordia Parish, Louisiana. Little Pecan Island Site An archaeological site of the Coastal Coles Creek culture, dating to 800 to 1100 CE near Grand Chenier, Louisiana in Cameron Parish. Investigations by Robert Wauchope in 1946 produced a number of flexed burials and ceramic chronologies which helped determine the age and cultural affiliation of the site. A multimound site in Adams County, Mississippi southeast of Natchez, Mississippi, with components from both the Coles Creek period (700-1000 CE) and the later Plaquemine Mississippian period (1000-1680 CE), when it was recorded in historic times as the White Apple village of the Natchez people. Morgan Mounds A multimound site of the Coastal Coles Creek culture, built and occupied from 700 to 1000 CE on Pecan Island in Vermilion Parish, Louisiana. Of the 45 recorded Coastal Coles Creek sites in the Petite Anse region, it is the only one with ceremonial substructure mounds and was possibly the center of a local chiefdom. A large multimound site with components from the Late Marksville to the Plaquemine period but with its main occupation during the Coles Creek period, located in Franklin Parish, Louisiana. Transylvania Mounds A large multimound site with 2 plazas and components from the Coles Creek (700–1200) and Plaquemine/Mississippian periods (1200–1541). It located in East Carroll Parish, Louisiana It is the type site for the Transylvania Phase of the Tensas Basin Plaquemine Mississippian chronology. A large multimound site with components dating from 100 BCE to 700 CE. It once had the tallest mound in Louisiana at 82 feet (25 m) in height. It is located in Catahoula Parish, Louisiana in the town of Jonesville. ^ a b Daniel A. LaDu (2009). An exploration of the age of mound construction at Mazique (22AD502), a Late Prehistoric mound center in Adams County, Mississippi (PDF) (Master of Arts thesis). Tuscaloosa, Alabama: Department of Anthropology, University of Alabama. Retrieved 2011-10-31. ^ Kidder, Tristram R. (2002). Anderson, David G.; Mainfort, Robert C. Jr (eds.). The Woodland Southeast. Tuscaloosa, Alabama: University of Alabama Press. p. 80. ISBN 978-0817311377. ^ Virgil Roy Beasley III (2007). "Feasting on the Bluffs : Anna Site Excavations in the Natchez Bluffs of Mississippi". In Rees, Mark A.; Livingood, Patrick C. (eds.). Plaquemine Archaeology. University of Alabama Press. p. 135. ^ Phillips, Philip (1970). Archaeological Survey In The Lower Yazoo Basin, Mississippi, 1945-1955. Peabody Museum, Harvard University. ^ a b Timothy M. Schilling (May 2004). Excavations at the Bayou Grande Cheniere Mounds (16PL159) : A Coles Creek Period Mound Complex (PDF) (Master of Arts thesis). Louisiana State University and Agricultural and Mechanical College. Retrieved 2011-10-31. ^ a b c Kidder, Tristram (1998). Lewis, R. Barry; Stout, Charles (eds.). Mississippian Towns and Sacred Spaces. University of Alabama Press. ISBN 0-8173-0947-0. ^ a b "Troyville-Coles Creek". Louisiana prehistory. 2010-07-01. Archived from the original on 2012-01-10. ^ "Indian Mounds of Northeast Louisiana:Balmoral Mounda". Archived from the original on 2012-12-24. Retrieved 2011-10-20. ^ "Indian Mounds of Northeast Louisiana : Cypress Grove Mound". Retrieved 2011-10-20. ^ "Indian Mounds of Northeast Louisiana : Deprato Mounds". Archived from the original on 2012-12-24. Retrieved 2011-10-21. ^ Leah Williams (2008). Paleoethnobotany of the Feltus Mounds Site (PDF) (Undergraduate Honors thesis). University of North Carolina Chapel Hill. Archived from the original (PDF) on 2013-02-23. Retrieved 2013-02-24. ^ "Indian Mounds of Northeast Louisiana:Filhiol Mound". Archived from the original on 2012-12-24. Retrieved 2011-10-20. ^ "Indian Mounds of Northeast Louisiana : Flowery Mound". Archived from the original on 2012-03-16. Retrieved 2011-10-22. ^ "Indian Mounds of Northeast Louisiana:Frogmore Mound". Archived from the original on 2012-12-24. Retrieved 2011-10-17. ^ "Indian Mounds of Northeast Louisiana:Ghost Site Mounds". Archived from the original on 2012-12-24. Retrieved 2011-10-20. ^ "Louisiana Prehistory:Marksville, Troyville-Coles Creek, and Caddo". Archived from the original on 2012-01-10. Retrieved 2011-10-20. ^ "Indian Mounds of Northeast Louisiana:Insley Mounds". Retrieved 2011-10-20. ^ Phillips, Philip (1970). Archaeological Survey in the Lower Yazoo Basin, Mississippi, 1949-1955. Peabody Museum. p. 435. ^ "Indian Mounds of Northeast Louisiana : Lamarque Mounds". Retrieved 2011-10-20. ^ Gomez, Gay M. A Wetland Biography : Seasons on Louisiana's Chenier Plain. University of Texas Press. p. 49. ISBN 978-0-292-72812-7. ^ "Indian Mounds of Northeast Louisiana:Marsden Mounds". Archived from the original on 2013-05-14. Retrieved 2011-10-20. ^ Fuller, Richard S.; Fuller, Diane Silvia (1987). "Excavations at Morgan : A Coles Creek mound complex in coastal Louisiana" (PDF). Cambridge, Massachusetts: Peabody Museum, Harvard University. ^ "Indian Mounds of Northeast Louisiana:Peck Mounds". Retrieved 2011-10-20. ^ Tristam R. Kidder. "Plazas as architecture : An example from the Raffman Site, Northeast Louisiana". 69: 514–532. JSTOR 4128404. ^ "Indian Mounds of Northeast Louisiana:Scott Place Mounds". Retrieved 2011-10-20. ^ Weinstein, Richard A.; Dumas, Ashley A. (2008). "The spread of shell-tempered ceramics along the northern coast of the Gulf of Mexico" (PDF). Southeastern Archaeology. 27 (2). Archived from the original (PDF) on 2012-04-25. ^ Jackson, H. Edwin (1998). "Little Spanish Fort: An Early Middle Woodland Enclosure in the Lower Yazoo Basin, Mississippi". Midcontinental Journal of Archaeology. 23 (2): 199–220. JSTOR 20708431. ^ "Indian Mounds of Northeast Louisiana:Sundown Mounds". Archived from the original on 2012-12-24. Retrieved 2011-10-21. ^ a b "Indian Mounds of Northeast Louisiana: Transylvania Mounds". Archived from the original on 2014-03-20. Retrieved 2011-10-20. ^ "Indian Mounds of Northeast Louisiana:Venable Mound". Retrieved 2011-10-20. ^ "Indian Mounds of Northeast Louisiana:Wade Landing Mound". Retrieved 2011-10-20.